I had a memorable auction last week in upstate New York. I want to tell you about it and share a couple of observations. But first, let me share a story from my early days in USA’s capital. Nearly 15 years ago my parents were visiting me in Washington, D.C. In preparation of their visit, I’d purchased tickets for us to watch a performance at the Kennedy Center. Just a week before they arrived, I also won a prize from a radio station. It included tickets to an afternoon performance at a community theater production. Both performances were on the same Saturday. As the show ended in Arlington, I was scooting them out the door to high-tail it to the Kennedy Center. I don’t recall the names of the productions we saw, but I do recall one distinct memory. Though the community theater production was well-executed, it felt even more amateurish when compared against the Kennedy Center show. Watching the two performances back-to-back starkly highlighted the actors’ differences in experience and quality. It was like night and day! I had a bit of déjà vu this past weekend. To get you up to speed, first watch this video clip from one of my first-year clients at a hospital benefit in the Adirondacks. It shows the top-notch entertainment from the auction, including an Olympic gold medalist. I had two “a-ha” moments, which I’ll share after you watch this video showing the exceptional entertainment the auction planner organized. Even though you’re not getting the full onsite experience, I’m wondering if you might have reacted as I did, even as you watched the video. When that little kid — the initial skater — took to the ice, it was impressive! Here’s this tiny gal … gliding across the ice … moving in ways that would quickly land me on my rear end. But then the older skaters arrive. And they are moving faster and doing jumps. Then the national champions skate. And they are skating even faster. Despite their more complex routines, they make it look easier. Then the Olympic gold medalist appears. Oozing a certain je ne sais quoi, he’s on the ice for less than a minute when he does an impressive flip (I didn’t get that flip into the video – sorry). If you had the chance to watch benefit auctioneers perform back-to-back like you watched these skaters perform (or as when I watched the two theater productions years ago), you’d immediately know who to hire for your auction. But as this isn’t an option, watch several videos of your potential auctioneers working to get a good sense of how each one commands a crowd. I’ve worked many auctions that had an honoree. But I can’t remember ever working an auction that had such a fitting tribute to an honoree. We can’t all honor ice skating champions. And we likely don’t all have access to Olympians for entertainment. But I think there’s more potential than what meets the eye. I’m going to challenge you to think about your options. For inspiration, consider that for several years, this event had a traditional sit-down dinner gala with a dance band. 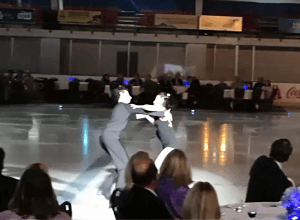 And because of a lack of large venues in her area, the planner had traditionally held this gala in the same place — in a room located just a few steps away from the ice rink. Moving the crowd into the rink and onto the ice was new. Eliminating a band to put on a skate show was new. The guests loved it! Dozens of attendees were chattering about how it was the best gala they’d ever attended. Are you overlooking the obvious in your area? Is there an unusual venue that hasn’t been used, but could be adapted to set your event apart? Can you tie in an honoree’s passion via the entertainment? Give it some thought. It will set your auction gala apart. Got some ideas? Feel inspired?